Das Bild zeigt mit Naginata bewaffnete Ashigaru (Fußsoldaten), nebst ihrem Anführer. 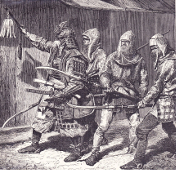 Laut Bildunterschrift: Japanese Warriors of the civil wars in the thirteenth century. Format: ca. 15,5 x 21 cm.